Pastilla, also spelled bastilla is a sweet and savory Moroccan meat pie. This pastilla recipe makes bite-sized pastillas perfect for parties and picnics. Pastilla, also spelled Bastilla is a savoury-sweet Moroccan meat pie made by filling a thin flaky pastry shell with a mixture of tender braised poultry, ggggs, and fried almonds. At first glace, a slice of pastilla could easily be mistaken for a dessert, since it’s generously dusted with powdered sugar and cinnamon, but the sweet crispy exterior belies the spicy, savoury mixture on the inside. Traditionally made with squab (a.k.a. 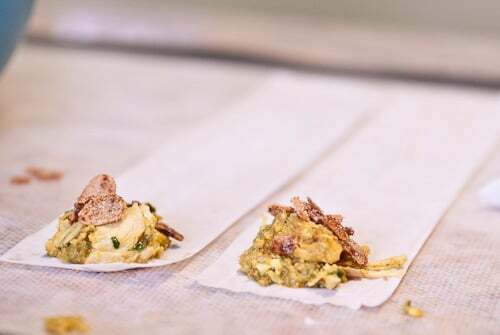 pigeon) and warka pastry, I’ve adapted this pastilla with ingredients that are more readily available here. As you bite into a crisp buttery pastilla, the sugar and cinnamon activates your sweet taste receptors, but the sweetness quickly fades as the savoury filling hits your tongue. The tender chicken and onions flood your mouth with an umami rich burst of flavour that carries with it, notes of ginger, turmeric and cardamom. Add to that the crunchy butter fried almonds and you’ll start to get a picture of just how magnificent this humble pastry can be. Working from home has some great perks (like walking around in boxers and cooking a meal for lunch), but it’s also a formula for getting yourself stuck in a rut. I offten miss the social interactions and light bulb moments that erupt from inane water-cooler conversations, and try to get myself out of the apartment at least once a day. Enter coworking. The idea behind coworking is that some of the best ideas materialize when you have other smart people around you to bounce ideas off of. Groups like Jelly NYC regularly hold coworking days at different venues around town. This allows for you to get your work done while getting a fix of social interaction once reserved for those receiving a regular paycheck. Best of all, the group and location is always in flux, allowing you to meet new people in new environments every time. I spent Friday with a group of about 15 coworkers at a Jelly NYC event that was hosted at Lab 24/7 this week. Jonathan wanted me to try coworking with someone else out of his kitchen, but unfortunately I wasn’t able to find anyone in time. While it would have been fun to spend the day cocooking with someone, these mini pastillas were fun to make and were gobbled up by a hungry group of designers, developers and marketing types in no time at all. It’s important to use clarified butter in this recipe since the milk solids in regular butter will burn before the almonds are fully toasted. Using clarified butter for the phyllo will also prevent your finished pastillas from taking on a mottled appearance. If you’re anything like me and are too lazy to clarify your own butter, you can buy it in jars at Indian groceries as “ghee”. If portability isn’t important, this recipe could be used to make a more traditional pie shaped pastilla. Just put down a few layers of phyllo and butter into a round pan, fill with almonds and chicken, then cover with more buttered phyllo. For those that have never worked with phyllo before or if you’re still recovering from a traumatic phyllo experience, check out my 5 tips to make Phyllo pastries. It can be a bit tricky to work with, but it’s really not too bad as long as you keep the dough moist. Line a plate with a couple layers of paper towels. Heat the clarified butter in a large saucepan until very hot. 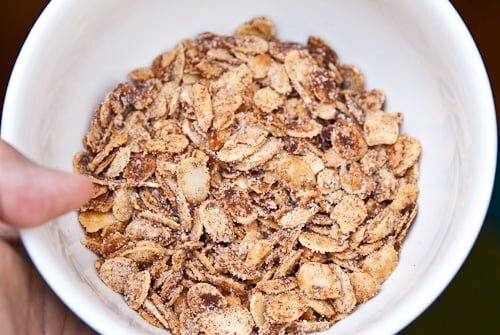 Add the almonds and fry until they are golden brown. They will continue browning after they're removed from the heat, so be careful not to get them too dark in the pan. Remove them from the pot using a slotted spoon and drain on the paper towels. 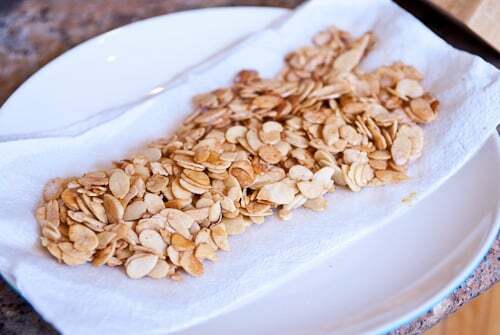 Toss the drained almonds with 2 Tbs sugar and 2 tsp cinnamon. Add the onions into the pot that the almonds came out of and fry until tender. Add the cardamom, turmeric, salt, ginger, coriander, cinnamon, cinnamon stick and black pepper and continue frying until the spices are fragrant. Add the chicken into the pot and cover with the onions. Turn the heat down to the lowest setting and cover the pot with a lid. Gently simmer the chicken for about an hour, or until the meat easily comes off the bones. There shouldn't be any need to add water since the onions and chicken will excrete liquid, however, if all the liquid evaporates and it starts burning, add a bit of water. Remove the chicken from the pot and discard the cinnamon stick and cardamom pods. Turn the heat up to thicken the sauce. When the chicken is cool enough to handle, remove the meat from the bones and shred it with your fingers. Once the sauce has reached a thick gluggy state, add the eggs and parsley. Allow some curds to form, then stir to scramble the eggs into the sauce. Turn off the heat and add the chicken back in. Taste and add salt as needed. Allow this mixture to cool (ideally overnight in the fridge). When you're ready to make the pastilla, put the oven rack in the middle position and preheat to 450 degrees F. Get a kitchen towel damp, then unfold the phyllo dough and use a sharp knife to cut off a 2" wide strip of dough from one end. Wrap the rest of it back up. Place your damp towel over the phyllo dough strips making sure to keep them covered once you've pulled a few sheets from the stack. Start by pulling 2 strips of phyllo off the stack and lay them out in front of you. Use a pastry brush to apply a light coating of butter onto each strip of phyllo. Put a scant tablespoon of chicken mixture onto a corner of each strip of dough. Sprinkle a pinch of sugared almonds on top. Begin folding the strips into triangles starting from the end with the filling. The motion is similar to how you would fold a flag. You can also roll them into tubes if you like. Place them on a baking sheet and brush the tops with more melted butter. Put them in the oven until the pastillas are golden brown then transfer to a wire rack. Repeat until you run out of chicken. 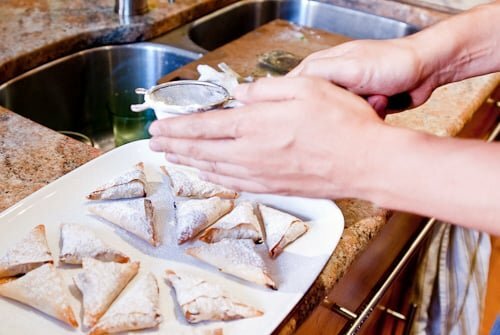 As the pastillas come out of the oven, put some powdered sugar into a small sieve and generously dust the tops. Sprinkle with a bit of cinnamon then serve while hot. I adore bistilla. These look quite nice. I had Bastilla at this Moroccan place ‘Casablanca’ in Sacramento. the chef/host was gracious enough to make a veggie version, with just the almond paste, among other things…Ive never had it since then…Your recipe looks uncomplicated….I might try it soon…Thanks! How do you prepare the 3″ piece of cinnamon? do you grind it? Add it to the mixture and remove it at the end? overall, it made me want to go out and get the ingredients right now. this looks fantastic. I just want to reach out and grab it! 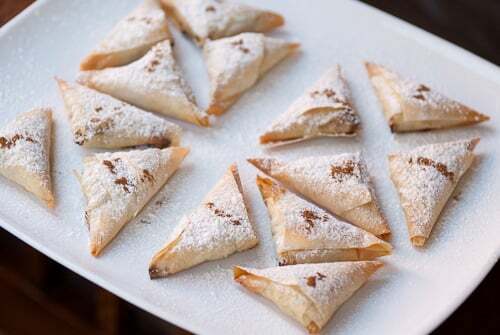 ate these a bunch when i went to morroco while getting shoewed in rose water, but not in these little spanikopita triangles. I remember gettign them as large disks and there was a distinct souffle consistency to the egg. Did you find that in yours? These are gorgeous, and I did, indeed, think they were some little dessert pastry deal at first glance. Love the juxtaposition of sweet and savory–I think it’s something that Americans haven’t caught onto enough. Perhaps you’ll start a much needed revolution! Sweet and savory are two tastes we love to see in combination. Making a version of these is on the list now. Those coworking events are also interesting. Though neither of us works from home, the idea is still one that sounds like a good one for any creative person. never had one of these. never had one. want one now. also wish i had the guts to be self-employed. These look great! There’s such a great mix of flavors here, these would be addictive. Looks great. My husband’s family recipe (he is Moroccan) doesn’t use cardamom, tumeric or cinnamon in the chicken, they do use saffron and they also add cilantro in the eggs. But I think every families recipe is a little different. My sister inlaw brought a magazine last time she came to visit from Morocco called saveur’s Cuisine Du Maroc. It is in French but has great pictures. I don’t know if you could find it in NYC. Jelly is such a great idea, here’s hoping it takes off over here. This looks delicious! I was thrilled to see a pastilla recipe when I took a peek at your site for the first time- there’s nothing more delicious to eat in Morocco than a hot pigeon pastilla and this brought back delicious memories. I have to say, I think I might prefer the idea of sliced almonds to the traditional ground ones…I will definitely have to try it this way! This is really beautiful–your entire blog is :). I love a sweet and savory treat, I bet this made the house smell amazing! You’re right, when I first looked at the photos, I thought I would be reading about a delicate little dessert pastry. But these sound delicious! have you had any experience with making these ahead of time and freezing? I’ve done the filling ahead of time and frozen which works great, but I’venever tried the whole pastilla. It should work in theory, my only thought isthat the phyllo might dry out/stick together over time. Might be better topar-bake them once before freezing, then finish them off in the oven whenyou want to serve them. I've done the filling ahead of time and frozen which works great, but I'venever tried the whole pastilla. It should work in theory, my only thought isthat the phyllo might dry out/stick together over time. Might be better topar-bake them once before freezing, then finish them off in the oven whenyou want to serve them. I used small phyllo pastry cups and guests LOVED this dish. How do you think this would do with boneless skinless thighs? Hi kmd90, it will work fine with boneless chicken thighs, the bones and surrounding cartilage does add additional flavor and richness to the chicken, but it’s not necessary. Well I thought that pastilla papers are phyllo dough but infact it turned out to be something different .. The pastry is much thinner and tastes better .. I found the receipe on youtube .. Very easy to make like crepes by adding just flour, salt and water and cook it over a water bath ..